Benjamin has his heart set on a career as a music (choir) director/conductor and in college plans to major in Music with a minor in Athletics. Of six children in the family, Benjamin is the youngest and the only one with PKU. From a young age, Benjamin has aspired to win a Guthrie award after reading stories of winners that appeared in National PKU News. He is a high achiever and has excellent grades, both as a home-schooled student (his mom is a teacher) and in a regular high school (he does a combination of the two), being on the honor roll throughout his high school years. 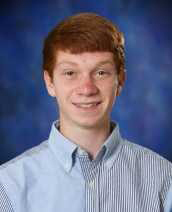 He was selected as a member of the National Society of High School Scholars. Benjamin loves singing and is a member of two choirs, both the elite A ’Capella choir and the Men’s Choir and has been inspired by the director to pursue his love of music in college and for a career. Last year he was chosen for the Honors Choir at the University of Concordia in Nebraska. He also plays piano, percussion and trumpet. He loves sports, particularly soccer. He was on the Concordia University of Wisconsin’s All-American Third Team for Soccer last year and this year is the soccer team captain for his school. He says, “My parents have raised me to accept the challenges I have been given in my life, and I have learned to accept the extra responsibilities that I have because of PKU and have grown to be a stronger person because of it.” For one year, his family hosted a teenaged girl with PKU from Germany, an “awesome experience” in which he learned a lot about PKU. His single greatest moment of realizing that PKU would not hinder his life was last summer where he played in an adult softball game sponsored by his church. While he has always aspired to be part of this team, he wasn’t sure he was as strong or good as his non-PKU brothers. But when it was his turn to bat for the first time, he astonished himself and everyone else by hitting a home run. He finally proved to himself that he was just as talented as his non-PKU brothers and realized that he could accomplish anything in his life that he set his mind to.